For those who live to fish, this is the time of year for surf fishing the south coast of Jalisco. August, September and October usually are the best months, and the prize fish for many is a roosterfish that may weight as much as 70 lbs. It is not unusual to hook a 40-pound or larger fish when they are running near the shore. The pros, guys who really know what they are doing, figured out a few years ago that with a good season, it is world-class fishing along this coastline. If you are not a serious fisherman, there is just the shear beauty of the stretches of beach that seem to go on forever. The Mayto area, a two-hour drive south of Puerto Vallarta is the first place that could be a base for fishing. Either north or south of Mayto, you will find lots of beach. There are places to stay in Mayto and also in the nearby fishing village of Tehuamixtle. Tehua also has boats for hire for those who do not want to surf cast from the beach. 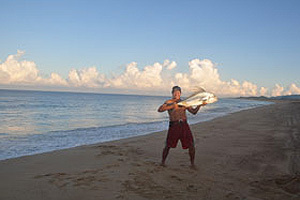 South of the Mayto area tends to be favored for the best fishing. The ocean currents that bring the warmer waters – and fish, seem stronger near Las Penitas, a beach about half an hour drive beyond Mayto. By the way, Las Penitas is also a place where the serious surfers from around Vallarta go. Just beach and ocean, no amenities, lodging, or tourist stuff. It is also possible to access this area by driving on highway 200 to the turn off to La Cruz de Loreto and then head back to the north along the coast. This by passes El Tuito, which is the usual gateway to Mayto and beaches. I prefer going through Tuito and perhaps continuing along the coast and then returning back up 200. It is always good to see something new along the way. This year also is the first fishing tournament to be held at Las Penitas. It is boasting a prize of $50,000.00 peso! The dates of the tournament are September 15th and 16th at Las Penitas. The event appears to be organized out of Puerto Vallarta, and posters are around most everywhere. Online information is available with a little searching. The prize money is big and sure to bring out a lot of folks. I might add that the serious folks, who fish this coast on a regular basis, always catch and release. Lots of photos and videos back up the stories, and the fish live for another day. A policy that benefits everyone.